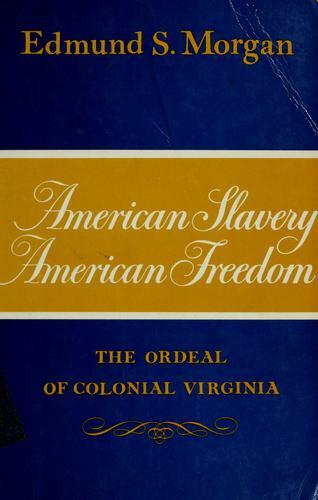 Today in class we finish up reading a selection from historian Edmund Morgan on the evolution of slavery in Virginia. Friday’s discussion on why early in the seventeenth century many blacks enjoyed the same freedoms as other Virginians went well as did our discussion of the challenges of managing a growing and increasingly discontented population of indentured servants. Today we need to wrap it up by following the landed gentry in their gradual realization that black slavery could not only meet their labor demands, but also assuage class tensions between landless whites and the landed gentry. It was slavery, I suggest more than any other single factor, that had made the difference, slavery that enabled Virginia to nourish representative government in a plantation society, slavery that transformed the Virginia of Governor Berkeley to the Virginia of Jefferson, slavery that made the Virginians dare to speak a political language that magnified the rights of freemen, and slavery, therefore, that brought Virginians into the same commonwealth political tradition with New Englanders. The very institution that was to divide North and South after the Revolution may have made possible their union in a republican government. Thus began the American paradox of slavery and freedom, intertwined and interdependent, the rights of Englishmen supported on the wrongs of Africans. The American Revolution only made the contradictions more glaring, as the slaveholding colonists proclaimed to a candid world the rights not simply of Englishmen but of all men. To explain the origin of the contradictions, if the explanation I have suggested is valid, does not eliminate them or make them less ugly. But may enable us to understand a little better the strength of the ties that bound freedom to slavery, even in so noble a mind as Jefferson’s. And it may perhaps make us wonder about the ties that bind more devious tyrannies to our own freedoms and give us still today our own American paradox. I am well aware that Morgan’s thesis has been challenged, but my goal in discussing this with my high school students is to introduce them to the process of historical reasoning and to move them beyond the traditional textbook as much as possible. Even in this short extract, Morgan’s ideas appear to be as clumsy and tangled as his pretentious prose. And they say Americans don’t do irony. I am suitably chastened. Nice one! All right, don’t rub it in! On a more serious note, do you think it possible that freed black men enjoyed the same freedoms as other Virginians when it came to courting white women? Thanks for the question, but I think we can do better. A better question is whether the racial line prevented black and white interaction in the early 17th century compared to just a few decades later. Bacon’s Rebellion seems to have been a watershed. After that, the frightened Virginian plantocracy plunged the blacks further into the animal kingdom, while gradually raising the status of their indentured white servants. Also, towards the end of the 17th century, the big West Indian sugar barons drove many smaller planters onto the continental mainland, and these embittered newcomers would have set a far harsher racist tone in the southern colonies, which was set in stone during the following century. The status of the slave-owning native tribes on the fringes of this system is interesting, pointing forwards from King William’s War to regiments like the Cherokee Braves in the Confederate Army. Morgan’s book, as I’m sure you’re aware, grew out of a classic 1972 article, “Slavery and Freedom: The American Paradox,” which is also ideal for classrooms. Actually it looks like you quoted the article in the post. Nevermind then. You are right. It is ideal for classroom use.